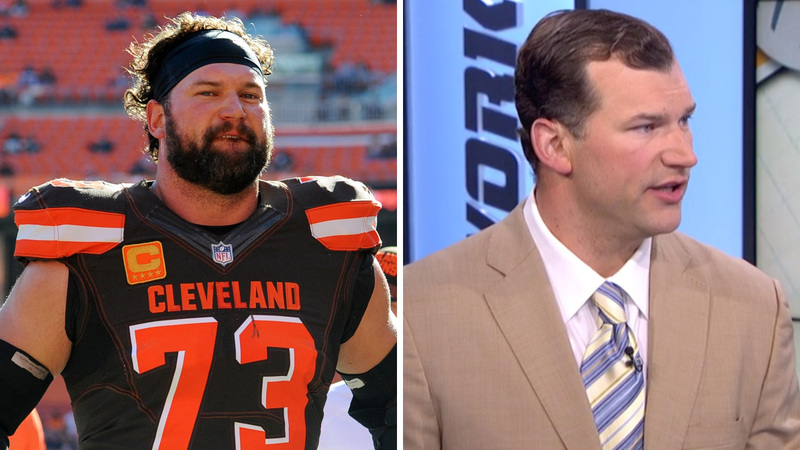 Former Browns left tackle Joe Thomas looks like a new man. Lose weight fast with this one easy trick! Lots of NFL fans see enormous offensive and defensive linemen and assume these are dudes who just love to eat and who would be 300 pounds regardless of whether they were playing in the NFL. Sure, some guys are like that, but there are plenty of players who have to fight to stay big and beefy. Just look at Joe Thomas. The former Browns left tackle stands 6'6" and was listed at 312 pounds during his final NFL season in 2017. The 33-year-old future Hall of Famer called it a career after tearing his triceps in the seventh game of last season and has now lost about 50 pounds. “I was more eager to lose weight than almost anything in retirement,” Thomas said yesterday on NFL Network. How did he do it? It’s easy. “You just don’t eat until you feel like you’re gonna throw up at every meal and all of a sudden the weight falls right off,” Thomas explained. Sounds simple enough, as long as you’re a world-class athlete. Cardinals third baseman Matt Carpenter has been on an absolute tear of late, going 9-for-17 (.529) with six homers, two doubles and three walks in five games against the Cubs last week. Carpenter isn’t sure what to credit for his current hot streak, but he’s not ruling out the salsa he makes from vegetables Adam Wainwright planted in his garden. The series in Chicago was the first time Carpenter brought the salsa on the road with him. After it brought him good luck, he brought it along to Cincinnati for the next stop on the road trip. The Cards lost yesterday but Carpenter went 2-for-4 with a double. Daniel Poncedeleon, the Cardinals rookie making his MLB debut a year after he was almost killed by a line drive, threw seven hitless innings. ... After a long battle for eligibility, a mule was allowed to enter an English dressage competition and won. ... Here’s a weird crew to be partying in Vegas together: Ben Simmons, Meek Mill and Robert Kraft. ... Dirk Nowitzki is officially coming back for a 21st season with the Mavs, an NBA record. ... Serena Williams said she was in the mood for Italian food, so her husband flew her to Italy. ... Today’s Tour de France stage was interrupted when the cyclists got pepper spray in their eyes after a protest by farmers. ... George Brett’s pine tar tantrum was 35 years ago today. This is Chase Utley’s final trip to Philadelphia and the fans are showing him so much love. If you’re not a soccer fan, Salah is one of the best wingers in the world. And yet he shoots hoops like the least athletic guy in your eighth grade class.